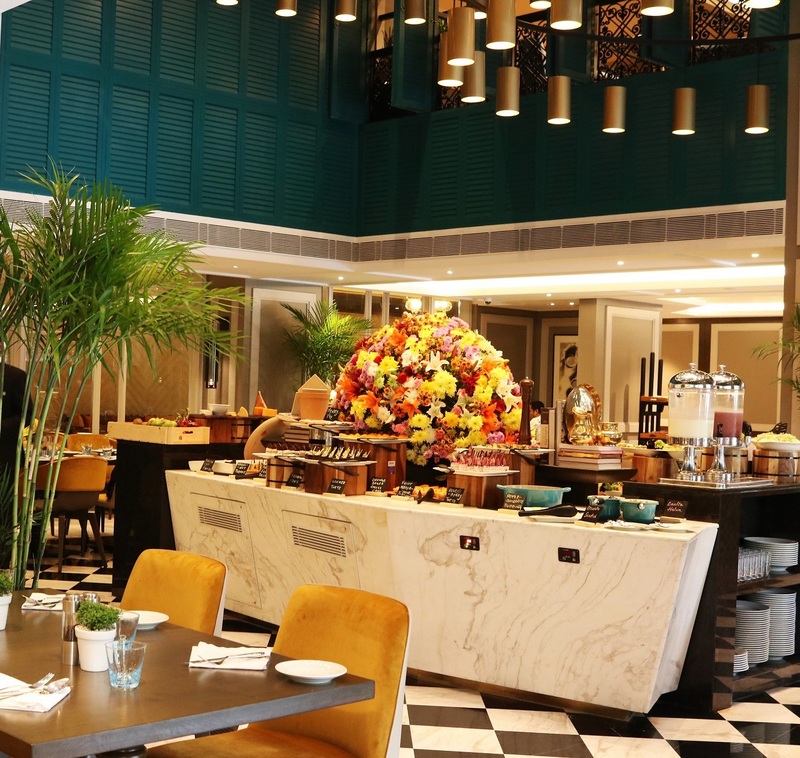 Walk into Cal 27, the newest all-day diner at Taj Bengal (the pin code of the hotel is 700027 and therefore the name) and you will feel as you’ve stepped into the courtyard of an old North Calcutta Rajbari/Jamidar Bari. From the chequered marble floors to the green ‘khorkhori janala’, one can clearly see where the designer was inspired from while conceptualizing the interiors. And for someone like me who is obsessed with old Calcutta and old Calcutta houses, that is the first thing that made me fall in love with the place that replaced another favorite, The Hub. Breakfast, lunch and dinner buffets aside, the highlights of Cal 27’s menu are the Taj Autograph Collection (signature dishes from Taj properties across the world), Taste of Calcutta (Calcutta specials like Singara, Maccher Jhol etc), Comfort Food (all-time favorites like Khichri, Butter Chicken etc) and Classic Grills. 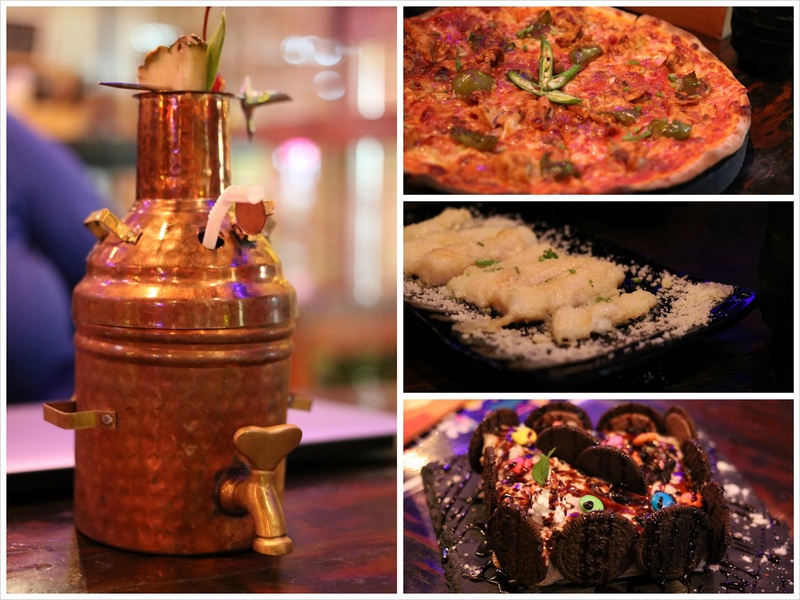 Plus, beverages, mocktails and cocktails (try the signature cocktail, Cal 27, a refreshing mix of rum, gondhoraj lemon and sugarcane juice), salads and sandwiches, burgers, pizza/pasta/risotto and desserts (Chilli Chocolate Parfait is a must-have). 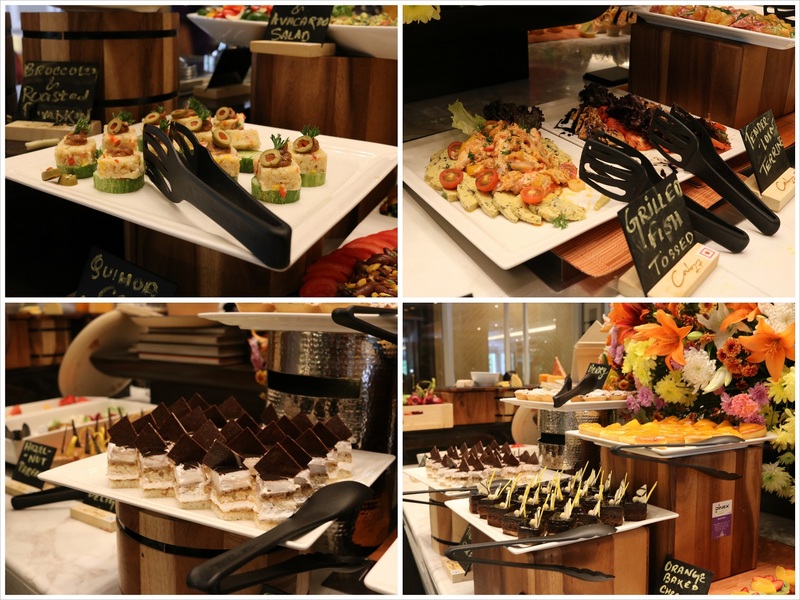 The Cal 27 buffet is a lavish affair! 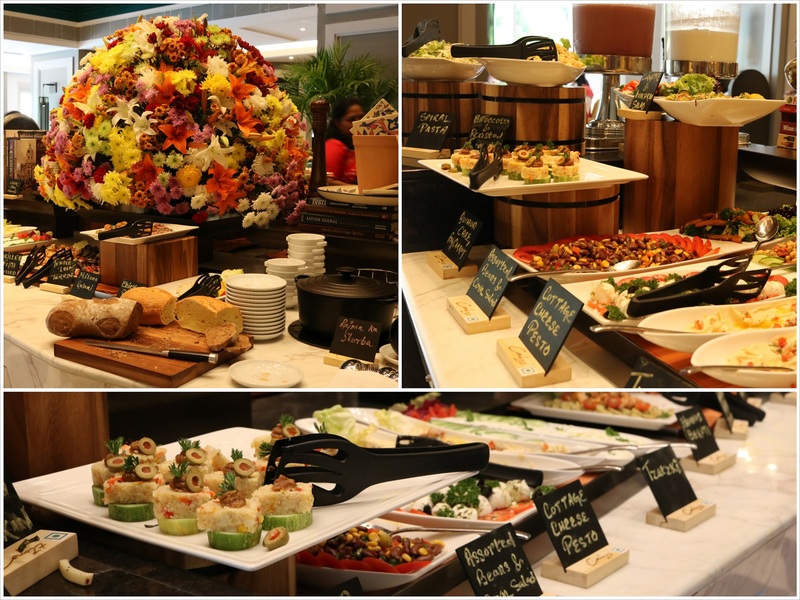 The buffet station is located right in the middle of the restaurant and you can spot a wide variety of salads, cold cuts, soups, breads, pizzas, pastas, main course dishes, desserts and fresh fruits. 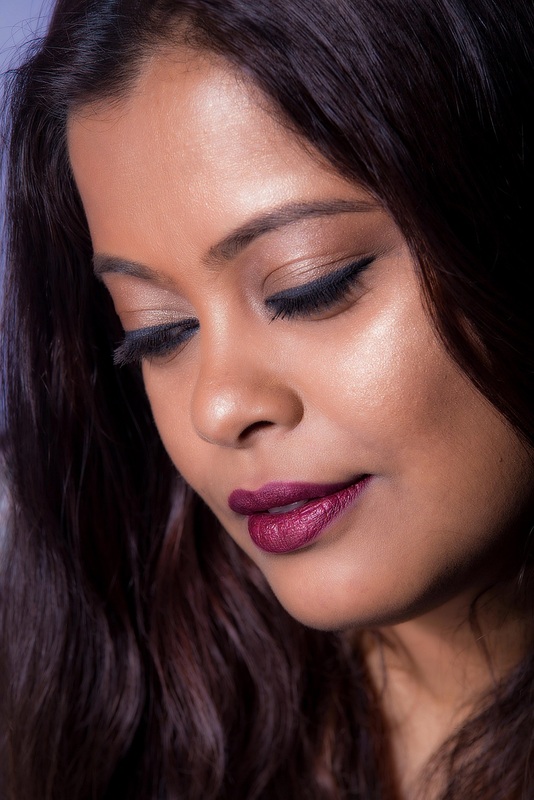 From Indian to Asian, European and Mediterranean, the options are limitless. I went on a Saturday for lunch and filled my plate with grilled fish, tenderloin terrine, Milano salami, sausages, succulent kababs, biryani, honey glazed pork belly and a brilliant orange and chocolate pudding. I am a dessert freak and I judge the quality of a good buffet by the number of desserts it has. The Cal 27 buffet has an endless variety. 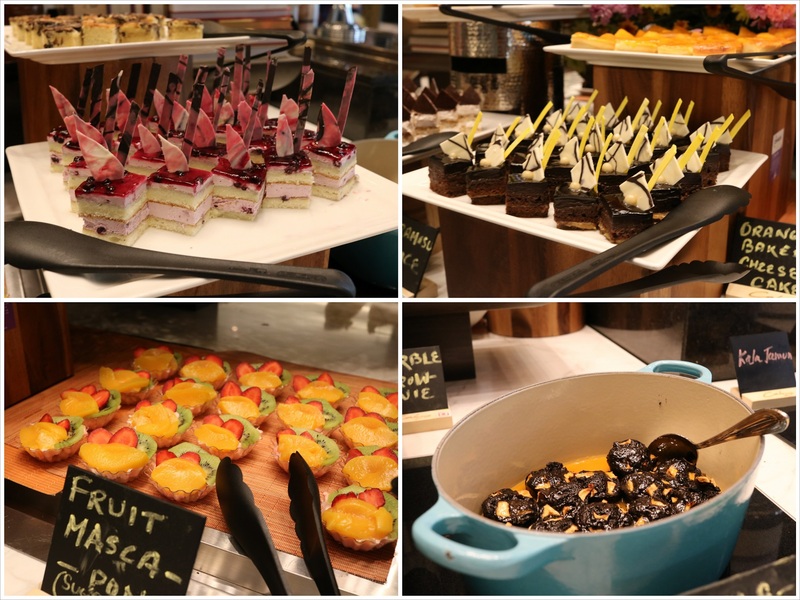 From tiramisu to cheese cake to pudding to tarts, fresh fruit and ice cream, they have it all. One day, I’m just gonna forget about the calories and go to Cal 27 only to eat the desserts in the buffet spread. Yes, they are that good! The best part of the Cal 27 menu for me is definitely the Taj Autograph Collection. 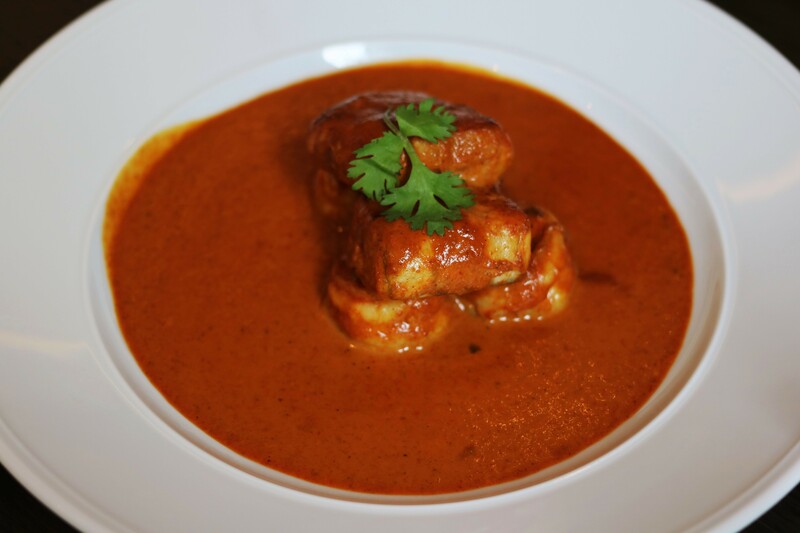 Sitting in Kolkata, you can sample the best dishes from some of the most iconic Taj properties across the world. Five dishes make up the Autograph collection. 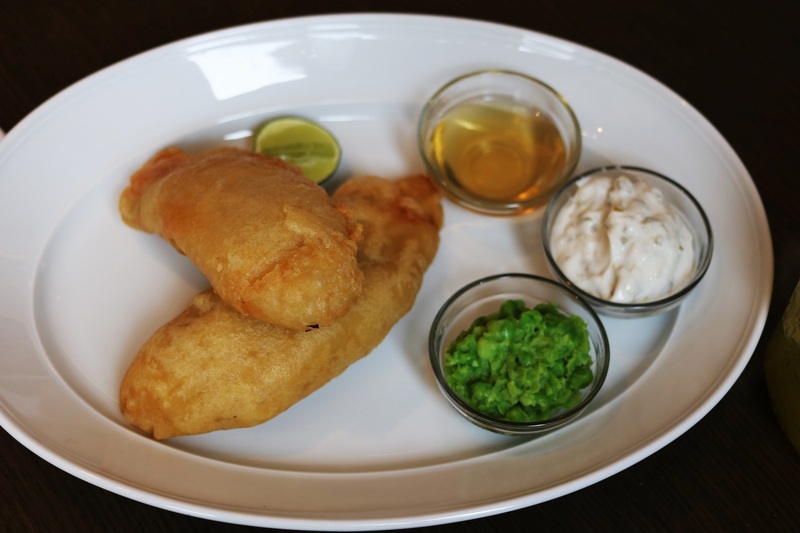 Fish & Chips from St. James Court, London – Calcutta bhekti deep fried in a beer batter and served with peas, tartare sauce, french fries and malt vinegar. Most restaurants mess up with Fish & Chips. Either the batter is not crispy or the fish is not tender enough but what is served in Cal 27 is just perfect. Moist, tender fish fillets wrapped in a light crispy beer batter. So British! Vegetable/Fish Exotica from Taj Exotica, Maldives – Fish exotica is fish and shrimp coconut curry served with rice, salad and crispy shallots. A spoonful of this curry will transport you straight to the white sands and clear water beaches of the Maldives! 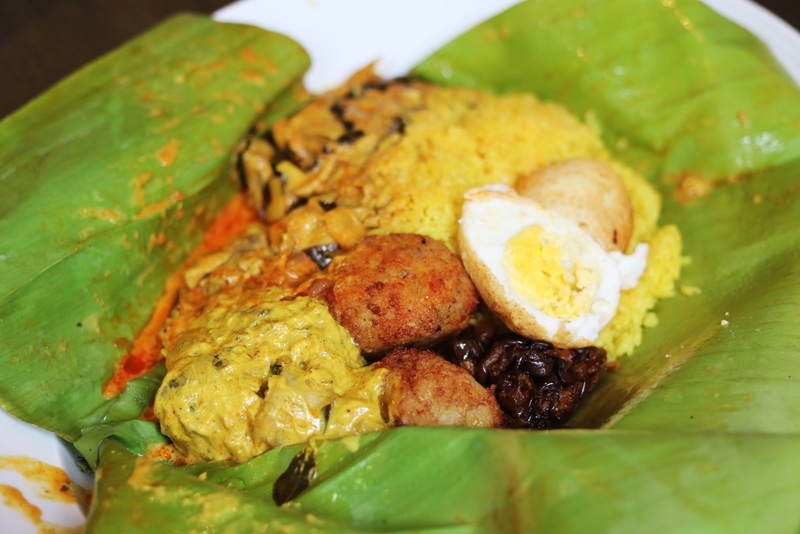 Vegetarian/Non Vegetarian Lamprais from Taj Samudra, Colombo – Sri Lankan specialty of yellow rice, vegetables or meat curry and egg wrapped and baked in banana leaves served with sambol. This dish is the epitome of comfort food and a distant cousin of the Bengali ‘khichuri’. It is messy and soggy but the taste makes up for it! 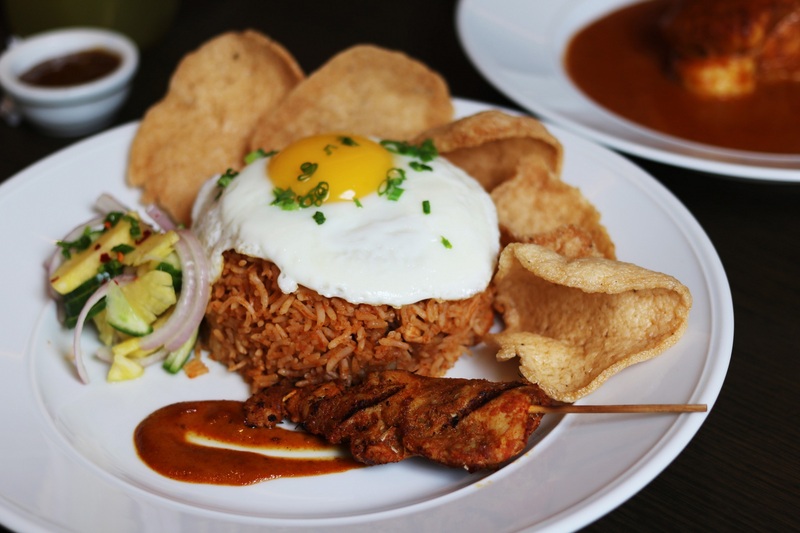 Vegetable/Shrimp Nasi Goreng from Vivanta by Taj, Langkawi – Fried rice tossed with shrimps, topped with a fried egg and served with chicken satay and crackers. This fragrant rice dish is the ultimate comfort food for spicy food lovers! Vegetable/Chicken Bunny Chow from Taj Cape Town – Bunny Chow or Bunny is a South African fast food dish consisting of hollowed-out bread filled with vegetable or chicken curry. This dish has a very interesting history as I got to know from the internet (geniuskitchen.com). ‘During the Great Depression in 1933, Indians, Whites and Chinese in Durban, South Africa, suffered hunger like everyone else. The kids then discovered that the cheapest curry they could buy (for a quarter penny or half a penny) was made by a vegetarian Indian caste known in Durban slang as the Bania. It was made from dried sugarbeans (no meat). The children didn’t have plates, and one kid got the bright idea to hollow out a quarter bread, asked the seller to put the bean curry in the hollowed-out bread, and then used the broken bread he’s taken out as a sort of eating utensil. Chinese food was called “chow”. Somehow the two words came together: Bania Chow. In time it simply became known as Bunny Chow. Bunny Chow was what the Indian sugar plantation workers took as their day’s food to the lands: curry in hollowed-out bread halves’. If you look at the menu of Cal 27, you will see that soul food or comfort food makes up the biggest chunk. It is food that you and I are familiar with and love eating. It is food that is not pretentious or claims to be ‘out of the box’ and that to me is the USP of the place. And the reason why I will be heading to Cal 27 pretty frequently. A gastropub created as a result of being stuck in jams and hearing traffic updates on the radio. Yes, that is the inspiration behind Traffic Gastropub, a place already creating a lot of waves in the New Town area. I went there last weekend and can say that I quite enjoyed getting Stuck in Traffic! 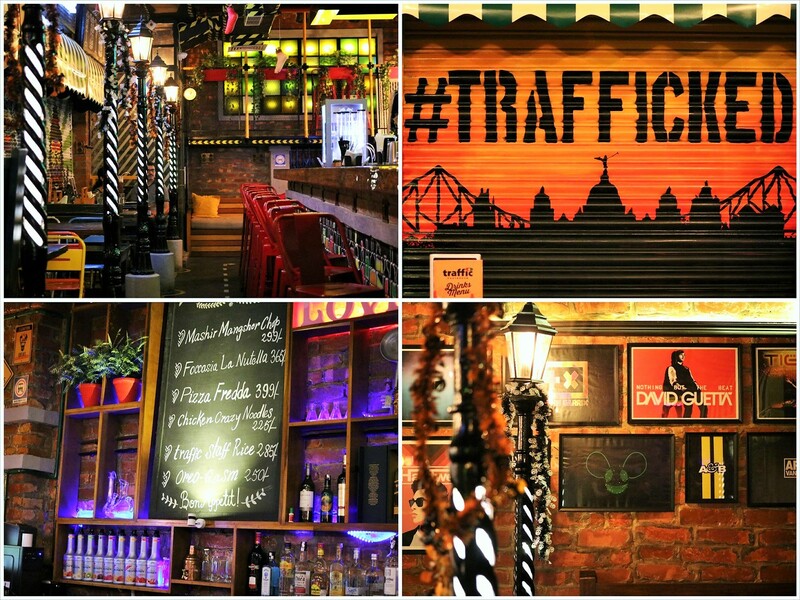 With bright lights, colorful posters and quirky wall art and installations, Traffic is the perfect chill zone. 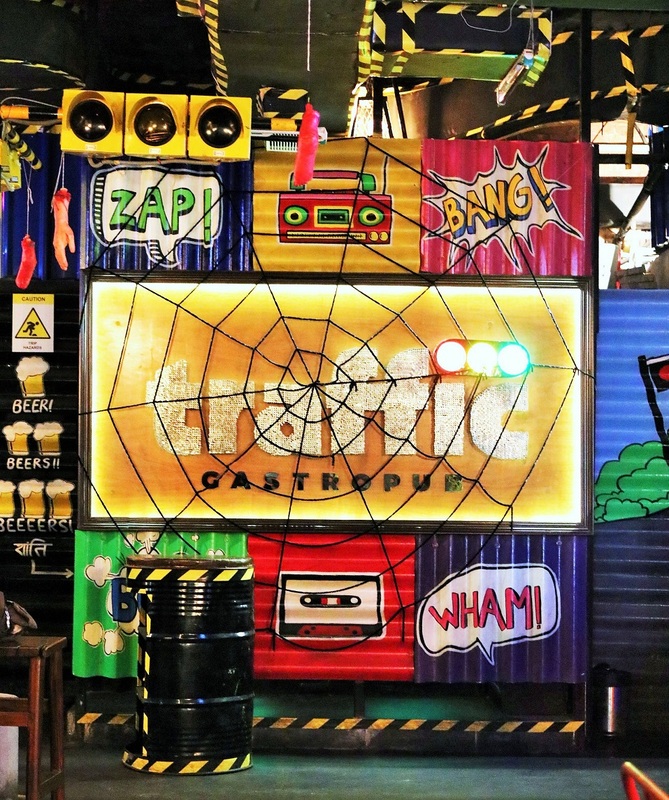 There’s a 25 feet long bar, there’s a DJ console that doubles up as a live performance area, there’s shisha and there’s yummy pub food and drinks. Here are my picks from the menu. Daru Ki Tanki – a potent mix of White Rum, Old Monk, Banana Liqueur, Bailey’s, Pineapple Juice, Fresh cream along with banana slices served in a copper Samovar. This Pina Colada meets Old Monk meets Bananas sounds kinda weird but everything comes together pretty well. Long Island Peach Iced Tea – This one’s a classic but at Traffic, the size is double of what you get elsewhere! Chilli Chicken Pizza – Chunky pieces of Chilli Chicken on a bed of cheese. Yass!! Parmesan Crusted Fish – Strips of fish coated with a generous amount of parmesan cheese and baked to perfection. 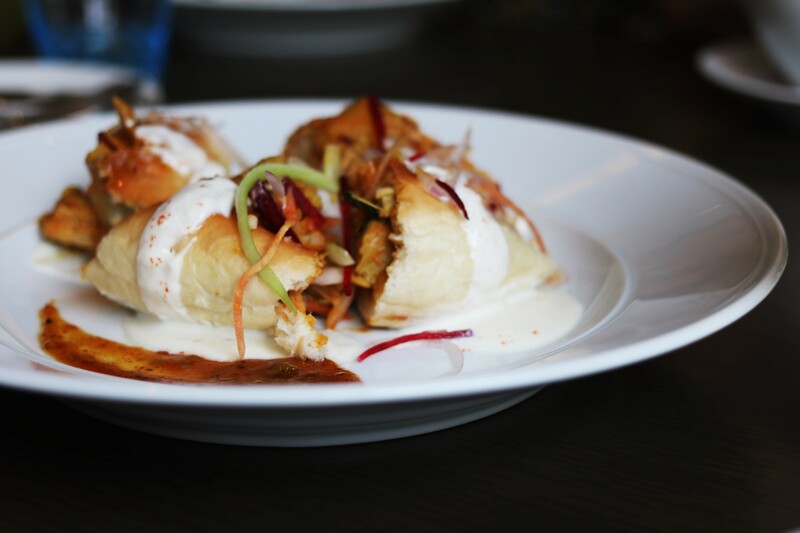 Shish Kabab Roll – ‘Mutton got stuck in a Traffic roll’ is how the menu describes this dish. This is basically mutton seekh kabab rolls hung on a skewer. Traffic is making waves for another reason as well. 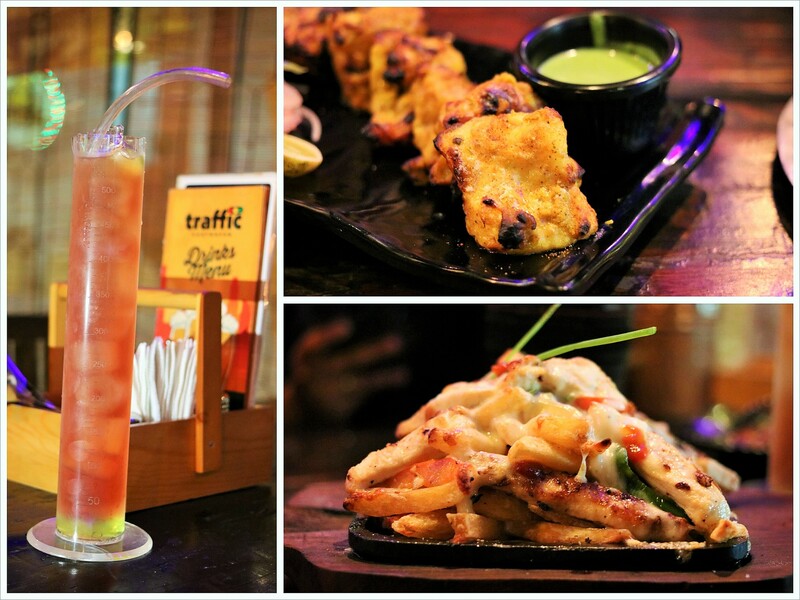 It has the cheapest Happy Hours in the city with drinks and cocktails starting at only Rs 49!! The No Refusal Menu is valid from Monday to Friday from 12 pm – 5 pm and the prices are insane. Old Monk at Rs 49, Smirnoff vodka at Rs 75, Cocktails starting at Rs 74 and 330 ml of beer at Rs 99 only. Happy you and happy wallet! Average Cost – ₹1,400 for two people (approx.) with alcohol. Excl taxes. I was invited by the management to dine at Traffic for review purpose. And this time they are taking us on a culinary journey across the country. 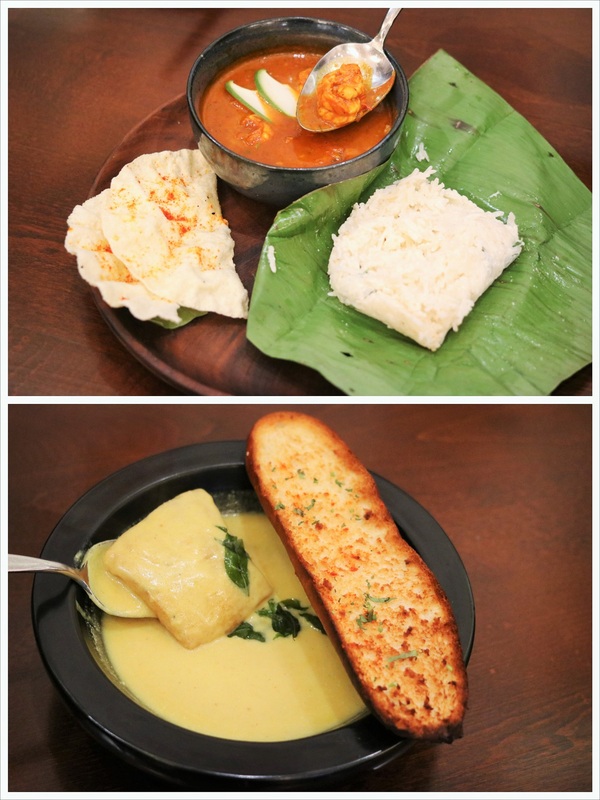 Yes, Bombay Brasserie, one of my favorite Indian restaurants in the city is back after a short break. Apart from the original location at Quest Mall, everything about the place seems to have changed. 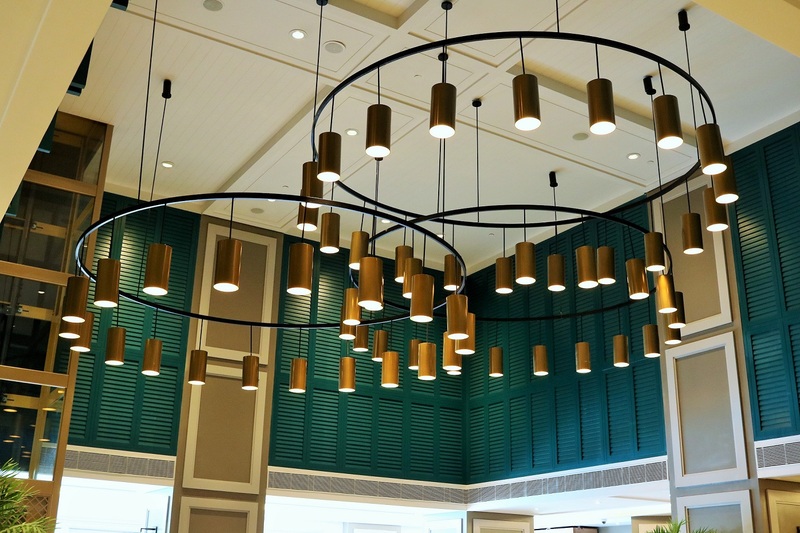 From the eclectic decor to the menu that focuses on experimental and fusion Indian food, things are quite different now. And it is a welcome change! There are three dining zones – two inside the restaurant and one outdoor area. Colourful chairs, exposed Edison bulbs, Pinterest-y bric-a-brac, all combine to give the space a very laidback feel. 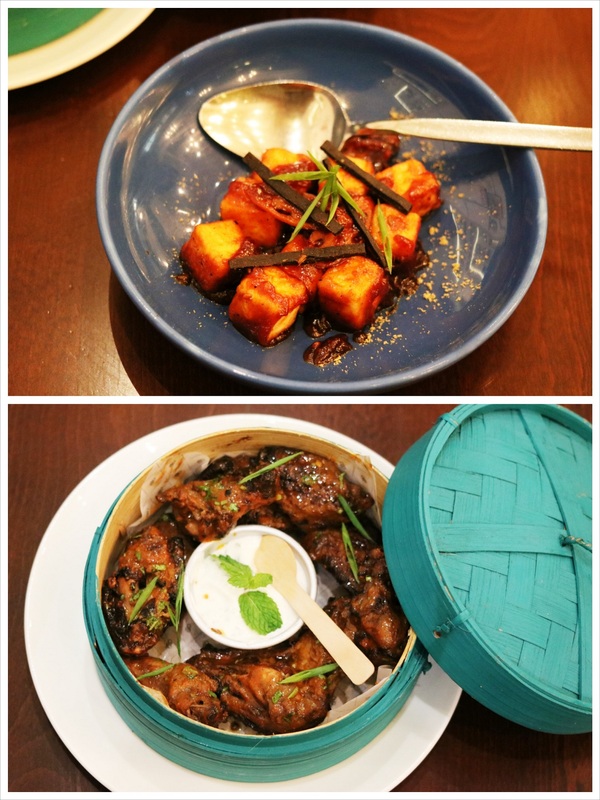 The travel theme is predominant and that’s what Bombay Brasserie is aiming for. They want to “Satisfy those cravings for good conversation and great food, through an exciting adventure that serves up the very best of India’s ingredients and dishes for the armchair traveller”. Patiala Bar is a highlight of the restaurant. 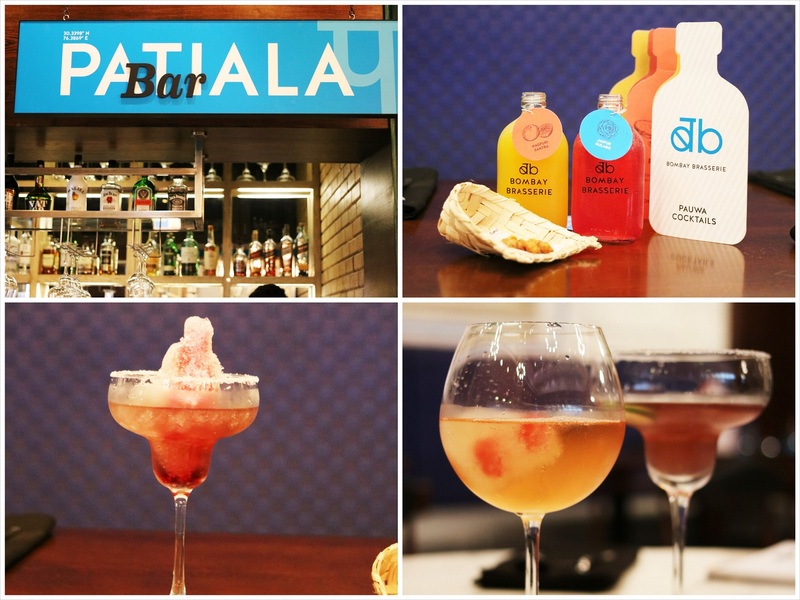 Old favorites and classics are presented with a twist and the best example of that are the Pauwa Cocktails. These are desi themed cocktails served in Pauwas or quarter bottles and paired with the right chakhna like masala cashews, roasted chana, murukku etc. The Pauwas come in many flavours and the ingredients are all desi spiked with either vodka, rum or whiskey. There is a Jaipur Gulabo, Nagpuri Santra, Go Goa Gone, Pondy Rush etc. Apart from the Pauwas, the bar also serves a wide range of desi and angrezi cocktails, wines and spirits. The food menu is extensive. Aam Papad Paneer I was told is a bestseller and after tasting it, I get why. The paneer is soft and fresh, the aam papad adds a beautiful sweetness to the taste and the lotus stem gives the right amount of crunch. If you are bored of the usual ways of how paneer is cooked in restaurants, definitely give this a try. And if you are ordering the Naga Ghost Pepper Wings, make sure you save some of that paneer because you will need it. The smoked and roasted chicken wings are flavored with the famous Bhoot Jolokia chilli and believe me, these will set you on fire. Tears will be streaming down your face but you will not be able to stop eating! If you love sea-food, definitely try out Mario’s Mango Prawns and Coconut Rice. The prawns are cooked in the traditional Goan ‘Ambotik Masala’ and the mild coconut flavored rice goes beautifully with it. The rice also goes very well with the Pondicherry Fish which is pan-grilled fish fillets in a lemon-cream gravy. The fish is served with Masala Bread Roll but I liked it better with the coconut rice. 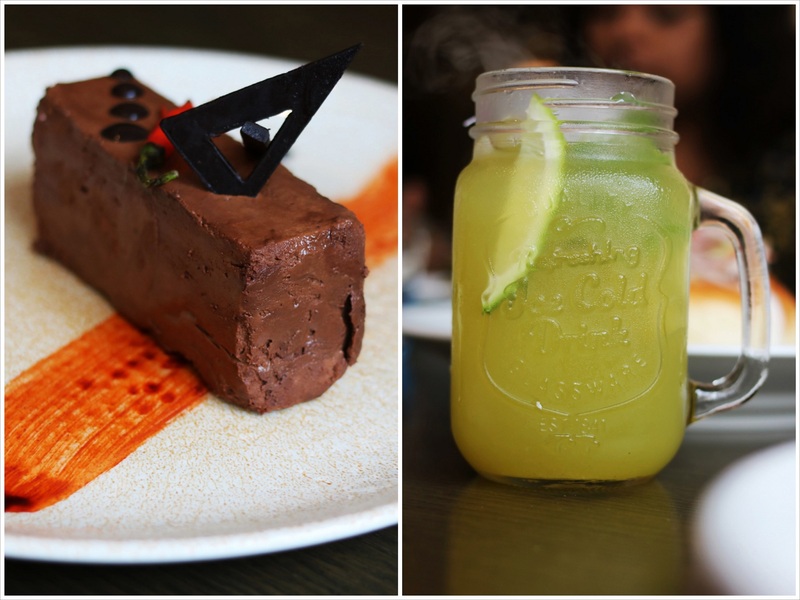 I tried two desserts from the menu – Amritsari Kulfa and Grandma’s Choco Treat. The Kulfa has all my favorite Indian sweets in it. 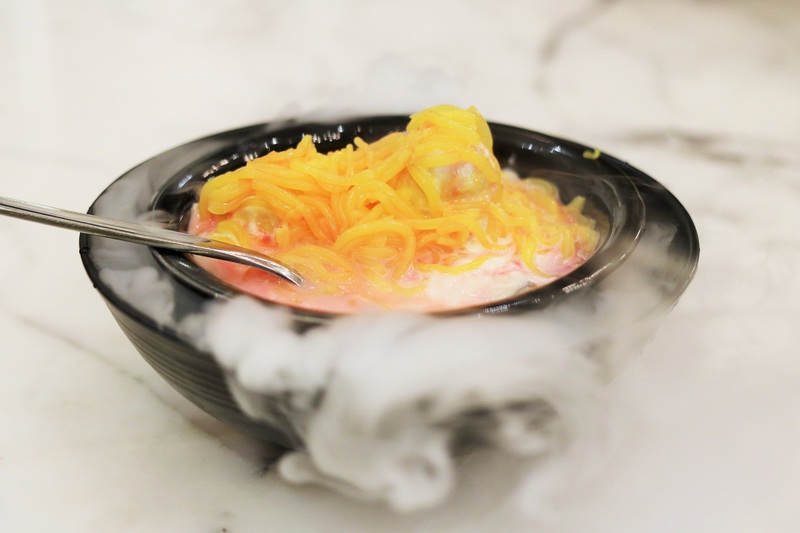 It has kulfi, it has rabdi and it has phirni topped with falooda and rose syrup. And Grandma’s Choco Treat is a twist on everyone’s favorite sweet paratha. This one is filled with chocolate and hazelnut spread drizzled with Bombay Brasserie’s ‘secret sauce’. The new Bombay Brasserie is all about reinventing classics and giving a taste of the familiar with the unexpected. As they say, “Sometimes a little change is a good thing”. I was invited by the management to dine at the restaurant. 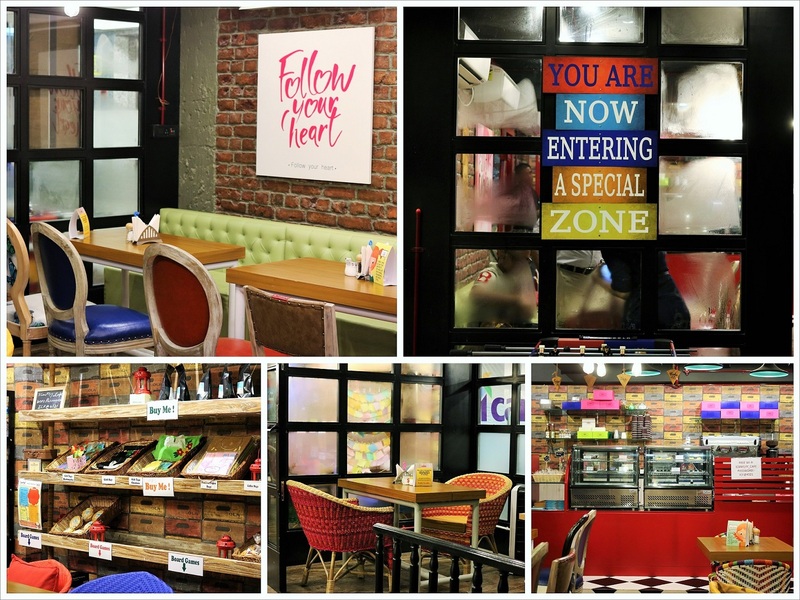 A new cafe that is cozy, quirky, colorful and run by adults with special needs. 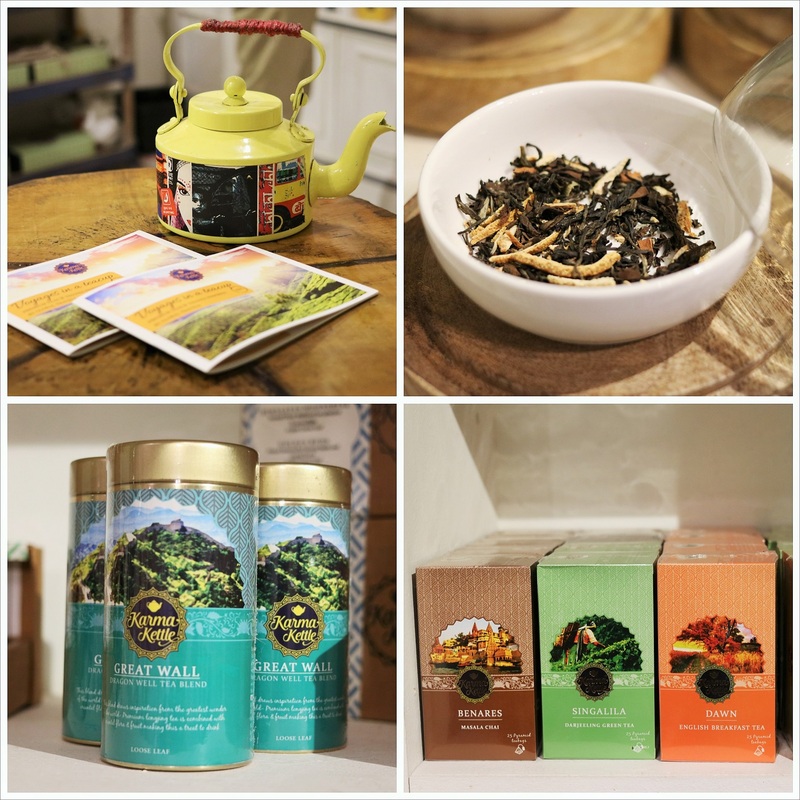 A tea room where you get the original texture and signature aromas of some of the most memorable teas of the world. Read about Cafe ICanFlyy and Karma Kettle in this post. This cafe is a special place for sure. Not just because it is run by adults with special needs like Prakriti , Komal, Saloni and Udita but because the warmth and love that you experience here makes every visit memorable. 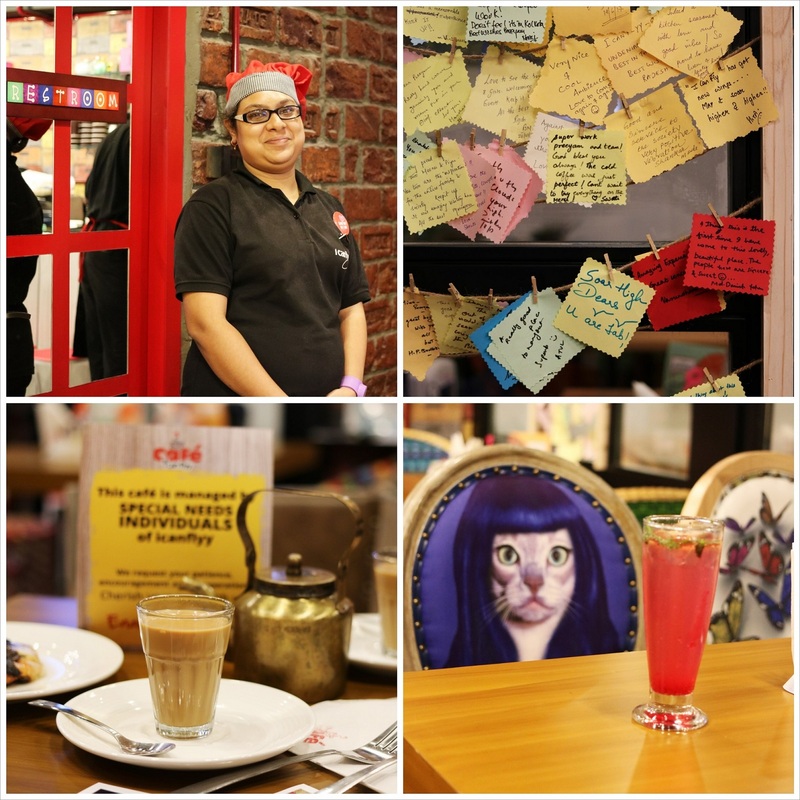 Located near Maddox square, the cafe is the brainchild of mother-daughter duo, Minu and Priyam Budhia who run the organisation, Caring Minds. Komal, Saloni, Udita and the others are participants of the I Can Fly program where they learn various types of vocational skills. And one of them is working in the cafe, interacting with guests and helping with the service. 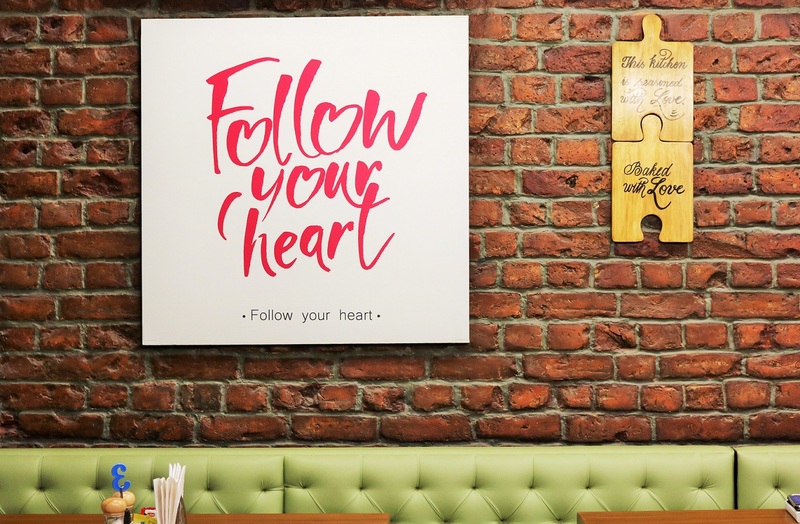 When you enter Cafe ICanFlyy, the first thing you will notice is the bright, colorful and quirky decor and of course the board that mentions Free Wi-Fi! There is both indoor and outdoor seating. There are ‘Pinterest’ type quotes hung on the walls, and you get to meet CatLisa and CatPatra as well. On each table is a personalized card telling you about who will serve you, their name and a little bit about them. Once you decide on your order, you will need to write that down and hand it over to your server. 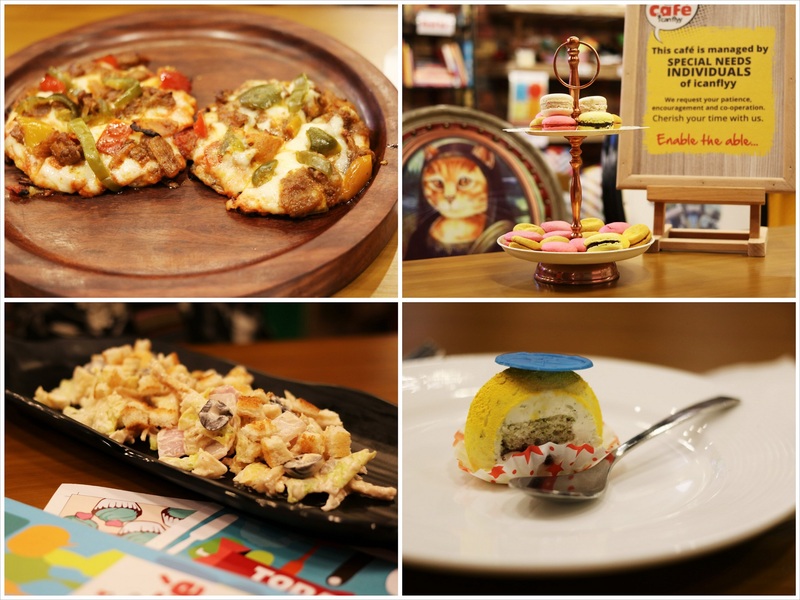 The food is your regular cafe food which means a variety of sandwiches, pastas, pizzas, Maggi and other tidbits. They also have a good range of hot and cold beverages like Berry and Basil Soda, Hot Chocolate etc. The cafe’s signature dessert is Caprese made with basil sponge, white chocolate mousse, mascaporne and tomato confit. Yes, tomato in a dessert and surprisingly, the combination works quite well! Prices are reasonable and you can easily get a meal for two at Rs 500. Other things that make Cafe ICanFlyy awesome is the availability of plenty of board games, a shelf dedicated to food and handmade products like bookmarks, coasters etc that you can take home, open mic and karaoke nights and a lot of fun events that take place regularly. The cafe is closed on Mondays. If you love tea then this place is heaven for you. 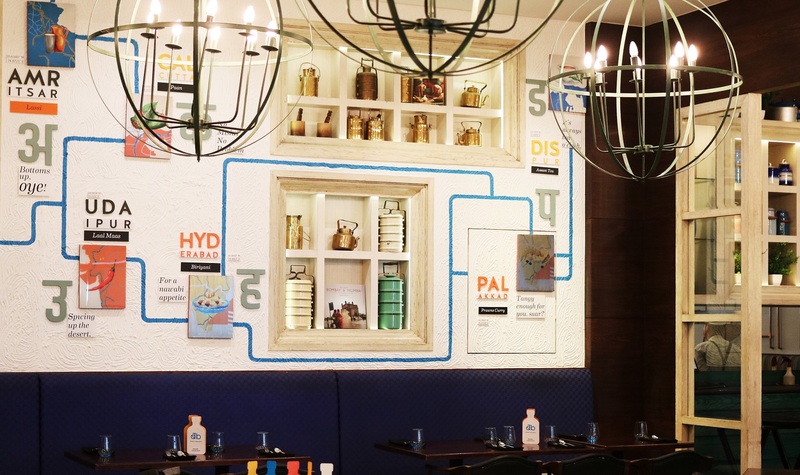 Located inside The Ivy House in Swinhoe Street, Karma Kettle is Dhiraj and Priti Arora’s venture to give Kolkata a taste of teas that are sourced from across the globe. Both of them are avid tea drinkers and travelers and Karma Kettle was born in 2013 when they decided to merge both these passions together. The family also owns Cochrane Place, a heritage boutique hotel in Kurseong with a specialized tea bar called ‘Chai Country’. 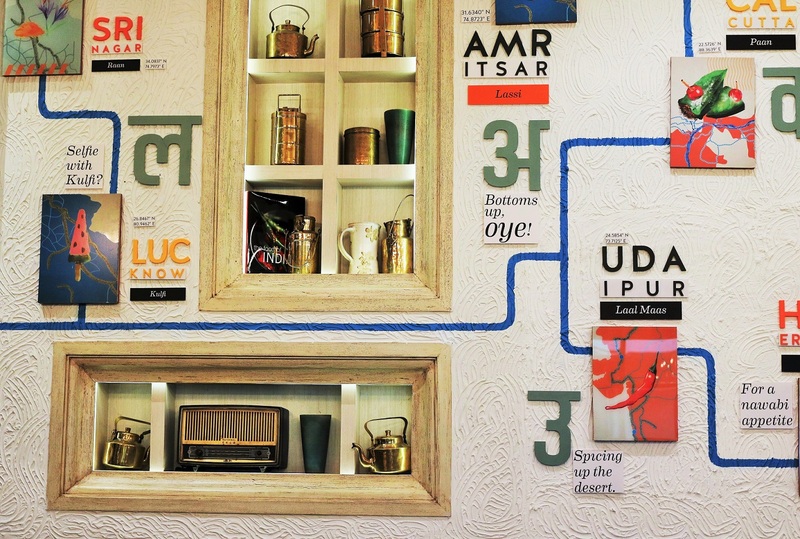 The decor of Karma Kettle is charming, quaint and if I may add, very pretty with both European and Bengali design elements. Inside the team room, you can spot a black desk which used to be a cottage piano ages back, glass test tubes containing exotic tea blends and shelves displaying around 40 varieties of tea in the form of tea bags, loose leaf and herbal infusions, packaged in attractive containers and boxes. Also on display are accessories like tea pots, kettles and tea cups. The price range of the teas start at Rs. 250. What to try at Karma Kettle? I loved Nathula, a caffeine-free tea that combines the herbal flavours of Tulsi with rhododendron and marigold flowers, Shanti, an aromatic tea that combines jasmine with green tea, Gulmarg, an exotic blend of green tea with spices, saffron, safflower petals, and almond bits and Maya, which is black tea with chocolate and cranberry. There are plenty of other options available that you can enjoy with some light bites. 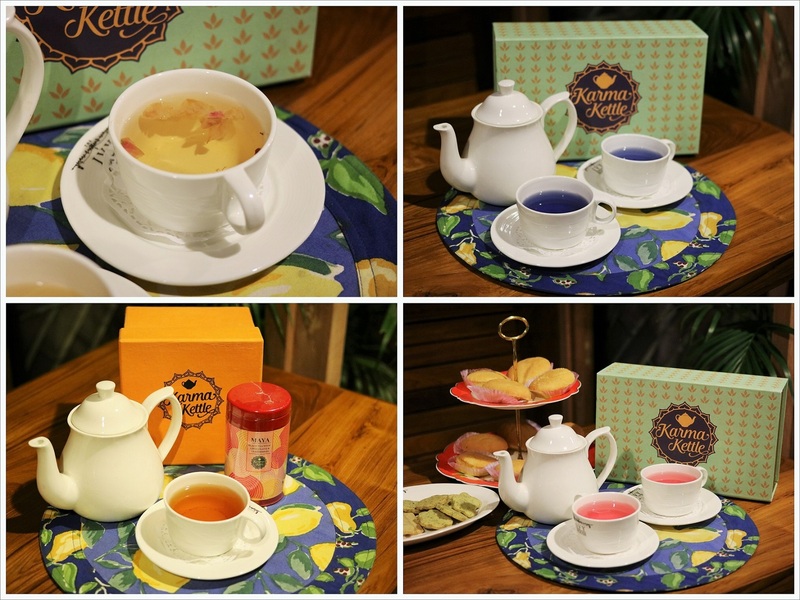 Do not miss out on tasting these wonderful tea blends at Karma Kettle. And the good news is that they are opening their own cafe very soon! 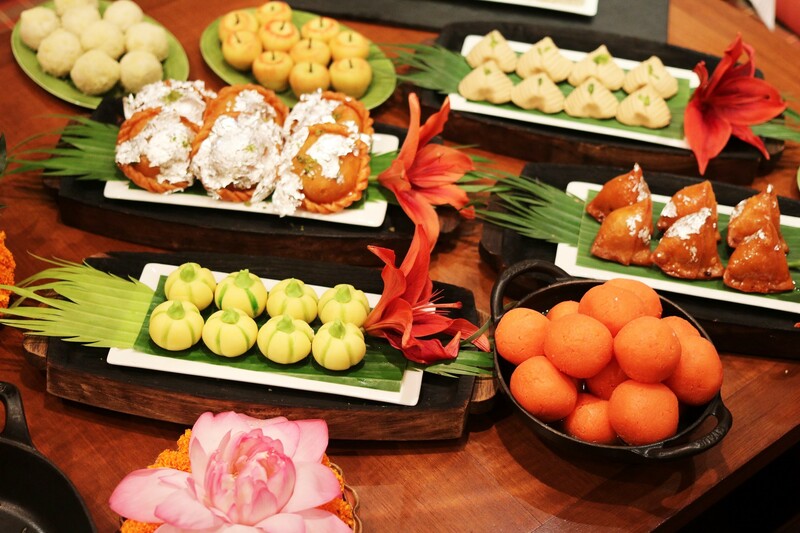 Kolkata’s star hotels are gearing up to present an extravagant feast during Pujo. 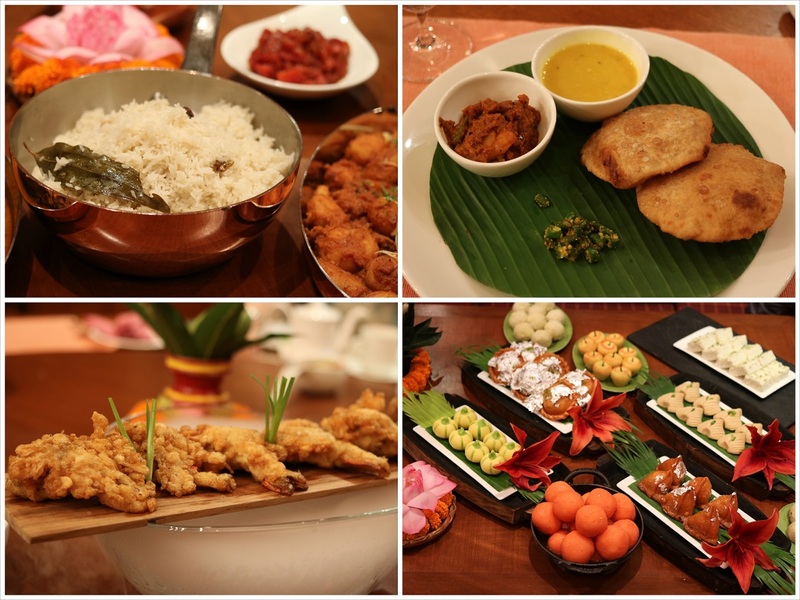 As expected, Bengali food rules the roost and elaborate lunch and dinner buffet spreads are planned everywhere. This year, the concentration is on providing a more personal touch to a buffet and thankfully for us, the prices have also been kept quite reasonable. If you’ve still not planned where to eat , this Durga Pujo 2017 food guide should be of help. While The Oberoi Grand lays out a fantasmagoric buffet each year, what is noteworthy, is that the quality remains consistently at the top. The Kosha Mangsho continues to be made of lamb, the sourcing of each ingredient is matchless and the end-result quite singularly the best. This year’s Grand Pujor Mahabhoj is arranged at Gharana and the focus is not just on providing good food (and a lot of it) in the buffet but on making it a memorable experience for guests. 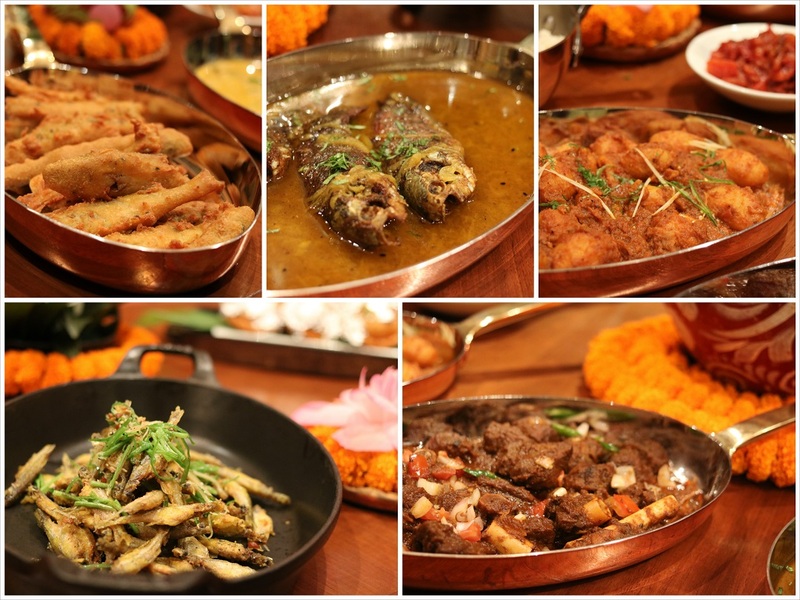 Priced at Rs 2000 plus taxes, the feast includes nearly 50-60 types of vegetarian and non-vegetarian Bengali dishes starting from ‘bhajas’ to ‘radha ballabhi and alur dom’ to fish dishes, meat dishes, rice and nearly 15 types of sweets made in-house. The buffet does not include Hilsa but if you want, it is available as an additional a la carte option at a cost of Rs 300 plus taxes per piece.